With Hurricane Joaquin threatening to hit the eastern seaboard this weekend, the United States’ largest naval base is on high alert. At Naval Station Norfolk, sailors are working to secure the base against impending flooding and prepare for Sortie Condition Bravo, an order for all Navy ships in Virginia’s military-saturated Hampton Roads region to be prepared to leave port within 24 hours in order to avoid damage to ships and piers from high winds and seas. In recent years, the accelerated rate of sea level rise in Hampton Roads has contributed to widespread flooding and disruption at some of the nation’s most active and important military facilities. While the path of Joaquin remains to be seen, the Navy has already been forced to take massive precautions to protect the assets and infrastructure of one of its most important — and most vulnerable — installations. 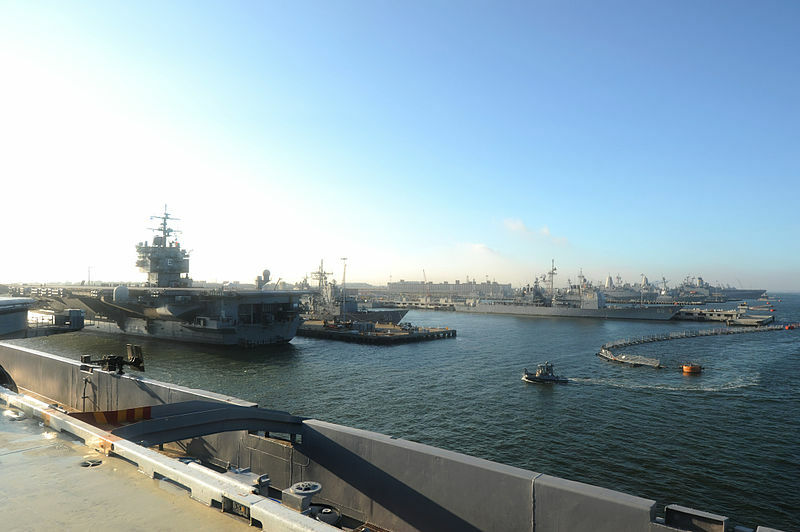 Comprised of Norfolk, Virginia Beach, Hampton and a dozen other localities in southeast Virginia, the Hampton Roads region is the epicenter of military activities on the East Coast. Each military branch has facilities in Hampton Roads, with over 100,000 military and 40,000 civilian personnel serving in the area. Unfortunately, Hampton Roads is also distinguished by its extreme vulnerability to storm surge and flooding. The combination of climate change-fueled sea level rise and sinking land (subsidence) has resulted in a rate of relative sea level rise over twice as rapid as the global average. While global sea level rise has averaged 8 inches over the past century, Norfolk has experienced 18 inches of relative sea level rise since 1900 and 8.79 inches since 1970. The National Oceanic and Atmospheric Administration (NOAA) has determined that Hampton Roads is the largest population center at greatest risk from sea level rise outside of New Orleans. Even seemingly small increases in sea level rise have drastic implications. By raising the starting point for tides and storm surge, higher sea levels have increased the frequency, magnitude, and duration of flooding events in Hampton Roads. While the Atlantic Hurricane Season is a particularly dangerous time for Hampton Roads, flooding has become an increasingly common part of everyday life in Hampton Roads. In some areas, floods that previously were only caused by unusually strong storms are now happening during a little above normal high tide. Major military facilities in Hampton Roads are extremely vulnerable to significant damage and disruption from flooding, as NS Norfolk, Norfolk Naval Shipyard, and Joint Base Langley-Eustis lie mostly or completely below 10 feet above mean sea level. Commanding officers at NS Norfolk have reported that flooding creates frequent interruptions to day-to-day base operations — costing time, attention, and budgetary resources. Many of the 13 World War II-era piers at NS Norfolk require significant maintenance due to the impact of sea level rise – and each pier will cost $35-40 million to replace. When storm surge coincides with high tide, NS Norfolk and other regional installations are particularly vulnerable. When Hurricane Isabel hit Hampton Roads in 2003, tidal levels rose almost 8 feet, putting most of Langley Air Force Base underwater. The storm affected 200 facilities on the base, costing $166 million in recovery efforts. Isabel caused an additional $130 million in damage to Navy infrastructure in the Mid-Atlantic region. More recently, NS Norfolk sustained severe damage from an August 2012 Nor’easter, which caused coastal erosion, flooding on the base and roadways, disrupted utilities, and scour of piers and bulkheads. Sea level rise in Hampton Roads is expected to not only continue, but to accelerate for the foreseeable future. Under business-as-usual projections, relative sea level rise in Hampton Roads is expected to increase by at least an additional 2.3 feet and possibly as much as 5.2 feet by 2100. Worst-case scenarios project 7.5 feet of sea level rise by the end of the century. The vulnerability of Hampton Roads’ bases and infrastructure is well-known to Department of Defense (DoD) leadership. This threat has spurred DoD to launch a first-of-its-kind, Intergovernmental Pilot Project on sea level rise resilience and preparedness in Hampton Roads. Housed at Old Dominion University, the Pilot Project is bringing together agencies from all levels of government, academic experts and the private sector to develop a coordinated regional approach to sea level rise adaptation. In the absence of state or federal policies on sea level rise adaptation, the Pilot is tackling issues ranging from land use and infrastructure construction to solutions to legal barriers to regional planning. In recent years, DoD has been working on several fronts to evaluate and respond to the risks of climate change, ranging “from the strategic (DoD’s Arctic Strategy) to the mundane (ensuring backup power and computer servers are not in basements where facilities are facing increased flood risk).” DoD has also outlined and updated its strategy to increase its resilience to climate change in its 2014 Climate Change Adaptation Roadmap. But despite the broad goals articulated by DoD, there remains a void in comprehensive, actionable policies for installations like NS Norfolk to manage the impacts of climate change. DoD has also failed to prioritize infrastructure projects that focus on climate change adaptation. In the absence of firmly established policies on climate change adaptation from Congress and DoD policymakers, the Navy and other service branches will be forced to continue to manage climate change events crisis by crisis. Hopefully Hurricane Joaquin will be a crisis avoided. This article is drawn from a forthcoming report on this topic. * NS Norfolk provides support for the entire U.S. Atlantic Fleet and is homeport to 59 ships — including aircraft carriers, submarines, cruisers, destroyers, large amphibious ships, and a variety of supply and logistics ships. Approximately 46,000 military and 21,000 civilian personnel and contractors serve at NS Norfolk, which also houses 18 naval air squadrons and serves as one of DoD’s busiest supply centers. By Caitlin Werrell and Francesco Femia in climate and security, national security, United States on October 2, 2015 .